Long considered one of the natural wonders of the world, the mile deep Grand Canyon is a destination that should be on everyone’s bucket list. This adventure takes you from the big city of Phoenix to the charming towns of Prescott and Sedona and a bit of everything in between. Splash up some fun during an inflatable kayaking adventure and cycle through a lush oasis in the middle of a parched desert landscape. Stand on the rim of the Grand Canyon and take in the breathtaking color, geologic features, and meandering Colorado River in an area teeming with a fascinating history. Explore the classic and funky Route 66 town of Williams and go back in time with a visit to Montezuma Castle to see the fascinating cliff dwellings of an ancient culture. With the experts in adventure, you’ll experience more than you could imagine possible on this jam packed itinerary full of Grand Canyon wonders and wows! The breadth and beauty of the mile-deep chasm of Grand Canyon is one of many marvelous scenes to take in on this six-day, action-packed adventure as you and yours uncover the best of Arizona’s magnificent high-desert country. From the refreshing waters of the Salt River to the rim of one of the world’s greatest natural wonders, find inspiration, rejuvenation and loads of fun on this trip of a lifetime through America’s colorful desert southwest with our Grand Canyon Vacation Package. 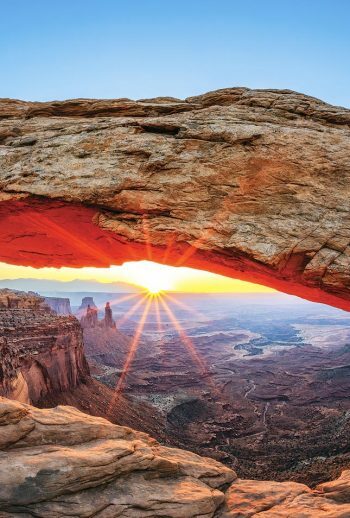 Geologic wonders: ancient sea beds, packed sand dunes and volcanic remnants are just a sampling of the various rock layers you'll discover in the country's most awe-inspiring geologic display. Pictographs and iron horses: discover the legends, adventure, culture and mystery of the wild, wild west as you explore castles, cliff dwellings, railways and museums in Arizona's historically complex canyon country. Elk, Condors, Bears, Oh My! During these action-packed days, keep your eyes open for the prolific wildlife roaming the grasslands, mesas and skies above Grand Canyon. Meet in Phoenix and shuttle to the nearby Salt River for a float trip by inflatable kayaks. This relaxing morning paddle is the perfect way to cool off on a warm day in Arizona’s desert. 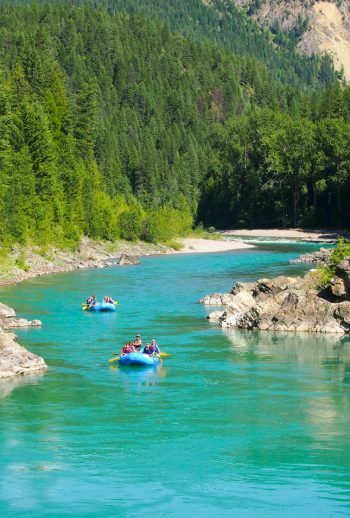 You’ll glide along lush green riverbanks and towering red cliffs, keeping alert for sightings of wild horses and bald eagles. Following lunch, we transfer to Prescott, nestled at an elevation of 5’200 feet above sea level amongst the largest stand of ponderosa pine forests in the U.S. Our centrally located hotel is in the perfect location for wandering the streets of this historic destination. Once the territorial capital of the state, Prescott is rich with history embodied in its world famous Whiskey Row and famous saloons of the Old West. Enjoy your first night’s dinner in the Peacock Room with your fellow travel companions. Since 1927, when writers and artists were drawn to the stunning landscapes of the American Southwest, the Hassayampa Inn has been the “Grand Jewel of Prescott,” a fashionable resort for the well-heeled. Begin the day with a bike ride on the Peavine / Iron King Trail through Prescott’s beautiful Granite Dells north of town. This crushed stone and dirt converted rail-trail travels through an oasis in the sunbaked desert. After a one hour transfer to the town of Williams, sit down to lunch at a local restaurant. The Keyhole Sink Trail takes us to a scenic box canyon where prehistoric residents left their mark carved into the canyon’s gray volcanic walls. After checking into our hotel, the night is free for you to explore and eat dinner in the funky town of Williams, located on the historic Route 66! Experience the luxury of a bygone era at Grand Canyon Railway Hotel. Designed to resemble the century- old train depot that housed the original Fray Marcos Hotel, this hotel is a relaxing retreat in a picturesque Western setting. The 297-room hotel is just a block away from downtown Williams and historic Route 66. Combined with a variety of amenities such as complimentary Wi-Fi, an indoor pool and hot tub, delicious dining options, and ideal location in “the Gateway to the Grand Canyon”, the Grand Canyon Railway Hotel is the perfect place to stay before embarking on your grandest of journeys. All aboard! This morning, we board the Grand Canyon Railway en route to the South Rim of the Grand Canyon. As you cross the Colorado Plateau, be on the lookout for elk, pronghorn and bald eagles as your knowledgeable train conductor shares with you the history of this fascinating region. Upon arrival, enjoy a delectable picnic lunch prepared by your guides. This afternoon, we check out the fascinating architecture of Hermit’s Rest before embarking on a “wow-inducing” hike skirting the rim of the Grand Canyon. Tonight, enjoy dinner in the Arizona Room at Bright Angel Lodge. Built in the late 1960s Kachina Lodge sits directly on the rim of the Grand Canyon. For guests seeking a more contemporary lodging option, Kachina lodge is a great choice. The guest rooms have a comfortable modern ambiance and are all similar in size and amenities. Many guests choose Kachina due to its prominent location in the center of the historic district. It’s a great choice for active guests as it is located directly on the Rim Trail. This trail spans from Hermits Rest to the Kaibab Trailhead, approximately 12.8 miles. From your room you can hike in either direction. This morning, we hike down South Kaibab trail to Cedar Ridge. The South Kaibab Trail winds us down into the depths of the Grand Canyon, giving us a much different perspective looking up at the Rim from below. We make our way down to Cedar Ridge, where the views of the Canyon and its colorful walls will leave you in awe. After a trailside lunch and break, we begin our hike up and out, stopping frequently to catch our breath and take in the magnificent surroundings. The afternoon is yours to relax or explore the South Rim Village. We’ll meet back up for an early dinner in the restaurant of the famous El Tovar Hotel. Today we say goodbye to the Grand Canyon as we head south out of the Park. We’ll bike the scenic Greenway Trail through ponderosa pine forests ending our ride in the small town of Tusayan near the park’s south entrance. Lunch at a local spot in Flagstaff. This afternoon, we check out Walnut Canyon National Monument. A loop trail takes us down into the canyon passing 25 cliff dwelling rooms constructed by the Sinagua, a pre-Columbian cultural group that lived in Walnut Canyon from about 1100 to 1250 CE. Continue your transfer to Sedona, check into the hotel and eat a final dinner at a lovely local spot in town. An award-winning Sedona Hotel with 600 feet of private Oak Creek frontage, awesome red rock views, plus uptown Sedona at your doorstep! The Best Western Plus Arroyo Roble Hotel & Creekside Villages is family owned and operated. With three pools, a steam room and sauna, pool tables and a game room on site, the kids (and their parents) are sure to stay busy for the duration of their stay. All of the rooms provide complimentary Wi-Fi, 46″ LED televisions with cable, luxurious oversized bath towels, pillow top mattresses and 300 thread-count sheets. You’ll love the sitting among the ancient sycamore trees down along the banks of Oak Creek! Today we gaze through the windows of the past into one of the best preserved cliff dwellings in North America with a visit to Montezuma Castle. After our short hike, we will transfer to Phoenix and say our goodbyes. Please plan on arriving at least one day prior to your trip departure. Day one of your itinerary starts at 8:30 am at the Holiday Inn Express Hotel &amp; Suites Old Town Scottsdale. Your trip ends with a drop-off at either the Phoenix Airport (1:00 pm) or the Holiday Inn Express (1:30 pm). Please make flights for 3:00 pm or later. Hiking: 2 to 5 miles per hike, mostly easy to moderate terrain. We would consider the uphill to climb out of the Grand Canyon via the South Kaibab Trail to be strenuous as you will be hiking up 1,000 feet over 1.5 miles. Don’t worry, we’ll take lots of breaks! Biking: 7 to 14 miles per ride on easy to moderate terrain. The Peavine / Iron King Trail near Prescott is crushed gravel and dirt, mostly flat. Other paths and/or roadways we cycle are paved with little traffic. Kayaking: 2 to 3 hour inflatable kayaking float trip down a Class I section of the Salt River. No experience necessary, guides will provide detailed instruction. Discovery: Widely considered as one of the world’s most spectacular canyons, the Grand Canyon is one of the “Natural Wonders of the World.” Called Kaibab by the Paiute Indian tribe, meaning “mountain lying down” or “mountain turned upside down,” the creamy white Kaibab Limestone forms the surface on which you’ll stand on while viewing the Canyon. Were you aware that the Grand Canyon is neither the deepest, longest, or widest canyon in the world; however, many consider it to be the most inspiring. Did you know that up until 1951 visitors climbed a series of three ladders to enter Montezuma Castle; that same year; Interstate 17 was completed and visitation skyrocketed. Concerns for both safety and structure (which is 90% original) led to the removal of the ladders. Come play in Arizona with the experts in adventure travel!